One day in July 2000, a bunch of friends and I were sitting at my home watching auto racing on Speed Channel (nee Speedvision). During the broadcast I made an off-hand comment about wanting to buy a race car again. Someone commented that I already had a veritable fleet of vehicles. I thought that comment odd, but then I started thinking about it: you know I did have a lot of cars at the time. One of those cars, the 1991 200q, was scheduled to be picked up by its new owner the very next day, so we decided to get The Fleet together for a last photograph. 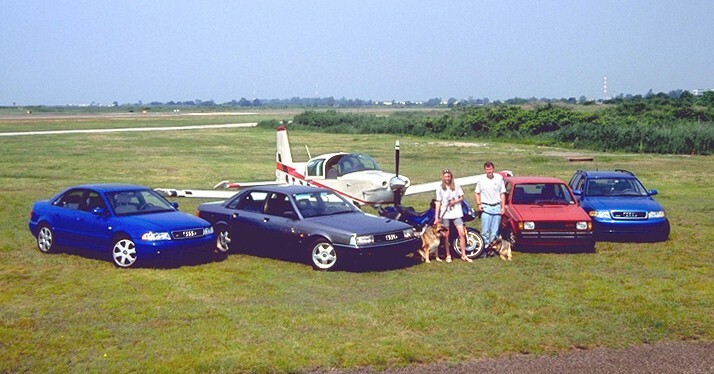 We drove all five vehicles to the Bridgeport CT airport, moved our Grumman Tiger into the grass next to its tie-down area, and arranged all the cars in front of it. Steve Williams was taking the photos of the cars when someone pointed out that except for the Grumman Tiger every vehicle I owned was German. It only followed that since my wife was a naturalized citizen of German decent and our two dogs were German Shepherds that the above photo materialized. Bud Amy's "Tales of the Hack"